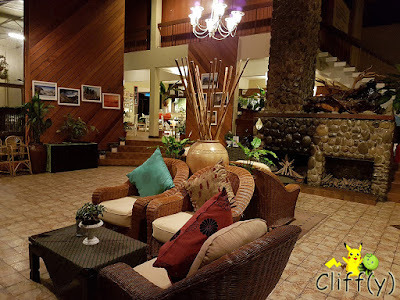 My BFF and I spent our first night at the mountainous region in one of the four Liwagu Suites by Sutera Sanctuary Lodges (3*) inside Kinabalu Park. 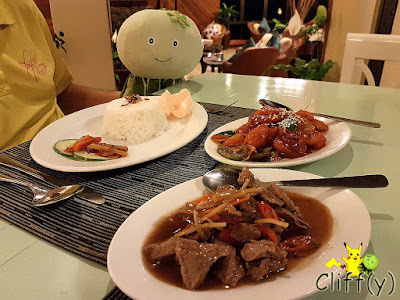 We had an elaborate set menu for dinner at Liwagu Restaurant, the same place where we had our lunch as described in the previous post. Melon was eagerly waiting for all the items to arrive at the table. 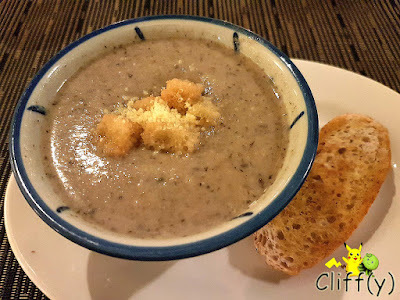 Interestingly, the set menu that we had, which was largely Chinese in terms of cuisine, included a piping hot bowl of cream of mushroom and garlic bread for each of us. It was thick enough for my liking with lots of blended mushrooms. 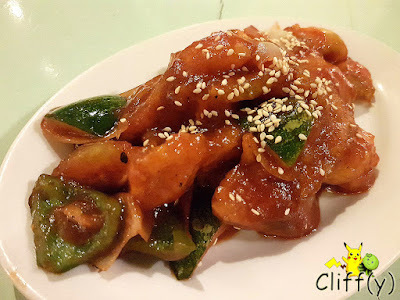 The sweet and sour fish that came with tomatoes, green bell peppers and sprinkled with sesame seeds on top was was enjoyable. The highly starchy sauce could be sweeter though to balance out the sour further. 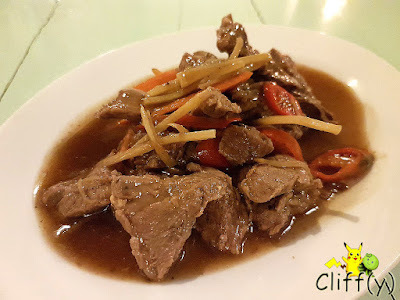 The stir-fried beef with oyster sauce, chili slices and ginger strips was actually quite savoury, but just a tad too salty when eaten without rice. The slices of red meat weren't tough, but they could definitely be tenderer. 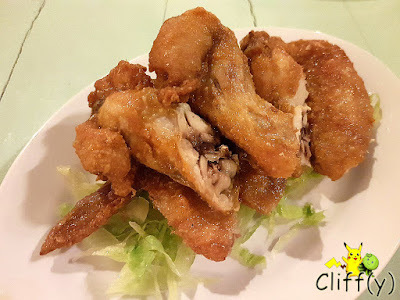 Drizzled with just a little bit of Thai chili sauce for a zing, the deep-fried chicken wings were crispy on the outside, while still retaining their juiciness inside. They were pretty oily though. Cooked with lots of garlic that made the dish aromatic, the bitter gourd slices weren't excessively bitter. 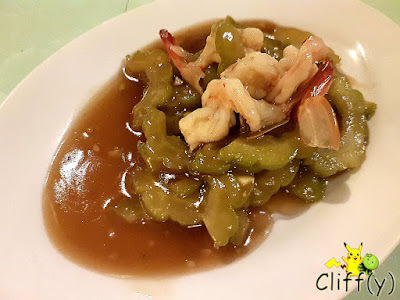 They came with springy shrimps that lent their natural sweetness into the dish. 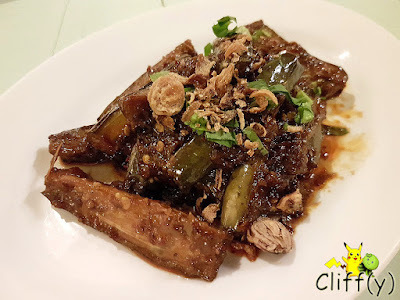 Topped with fried shallots, the dish of stir-fried eggplant with chili was sweeter than it was spicy. I'd certainly love to have it spicier. I was thankful that the eggplant seeds, though edible, didn't make their way into the dish as I don't like them. 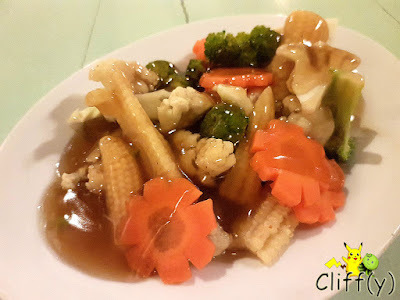 The stir-fried assorted vegetables weren't bursting with flavours, but I didn't mind that. Unfortunately, the flower-shaped carrot slices hadn't been cooked long enough as they were still pretty raw to me. 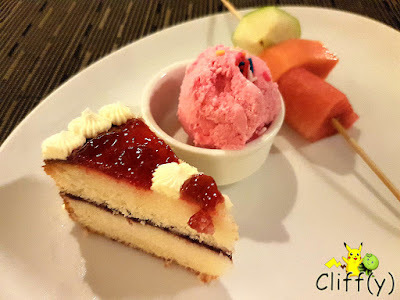 At the end of the meal, each of us had a trio of dessert items: a fruit skewer, a scoop of strawberry ice cream and a slice of cake. The cake with strawberry jam was pretty dense and adequately sweet. 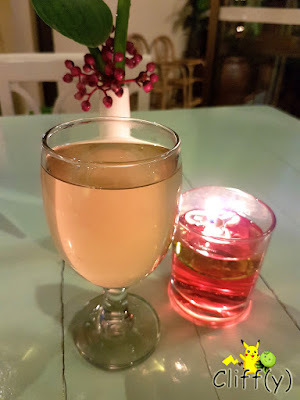 The free-flow hot tea was refilled promptly. 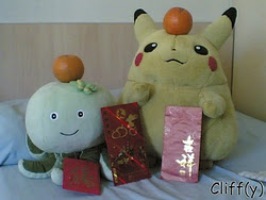 Pika's advice: If you're a buffet junkie, you may want to have your dinner at Balsam Buffet Restaurant instead with no additional charge to your room rate. *No separate price given as dinner set is included in the room price.